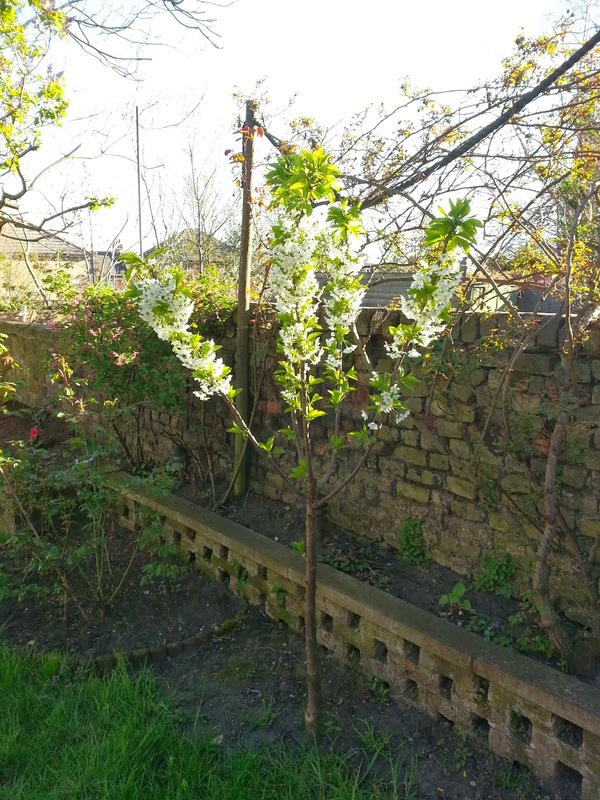 Shortly after moving in to the house I bought a Stella Cherry tree on colt rootstock. This tree thrived in my garden and last Spring, in late April I was able to enjoy the beautiful white blossoms. I was really looking forward to the sweet red cherries that would surely come in the summer. The Stella Cherry, Prunus Avium, is self pollinating and produces black sweet cherries in summer. My garden is north facing and even so my Stella does not seem to mind it. Below is a picture of the Cherry in full blossom. I was so proud and happy that I told pretty much everyone I knew, about my cherry tree and the cherries that awaited. Sure enough in late May there was no doubt that I could see cherries forming. They were little to start with. Week by week they were getting bigger. And surely I would definitely enjoy the produce once the cherries were ripe. But one day I noticed that something wasn't quite right. Every day I would see less unripe cherries. Surely no bird would eat those? But day after day, there would be less. Until one day I found a branch on the ground. Some evidence that something was there. It couldn't be a bird. Could it be a fox? A squirrel? Finally one sunny morning in May I found my answer to the riddle. It was a squirrel. Not one, but three squirrels in my garden grabbing whatever they could. They must have been hungry. Finally after more damage to the small tree, I decided that I didn't care so much about the produce but was more concerned about the tree. The Squirrels were not just eating cherries. They were biting the branches. So I removed all the cherries and composted them. That was the end of the cherries. This year the cherry tree is again nearing blossom. And I am already planning a way to protect the cherries from the squirrels. Perhaps plenty of peanuts will do?